Permeable carbonate sands are the building material for coral reef frameworks, and modern shallow reef environments such as lagoons, reef flats and coral sand cays. Sands form from the breakdown of corals and other carbonate reef organisms and accumulate over thousands of years and can be the major repository of carbonate in modern coral reefs (see white areas in poster image above). For a coral reef to grow or be maintained, carbonate production (plus any external sediment supply) must be greater than the loss through physical, chemical and biological erosion and transport and dissolution. Ocean acidification refers to an increase in ocean acidity due to the uptake of carbon dioxide that humans are emitting into the atmosphere. The uptake of around one third of the human emitted carbon dioxide by the oceans has offset global warming, but the oceans have become increasingly acidic as a result. Most of the work on the impact of ocean acidification on coral reefs has been on corals, which are expected to grow less as the oceans acidify. As such, there will be less carbonate material available for coral reefs to accrete. This emphasis on the corals probably reflects the dominance of biologists working on reefs compared to (bio)geochemists. This project began due to insights from my earlier work on nitrogen cycling in permeable carbonate coral reef sands, such as how biogeochemically reactive these sands are, and the importance of the diel light cycle and advective flow as a driver of this reactivity (e.g. Eyre et al., 2008; 2013). This got me thinking that these processes must also be important for shallow water carbonate sediment dissolution. I did some reading and found that most CaCO3 sediment dissolution work up until then was laboratory experiments on the solubilities and dissolution kinetics of CaCO3 mineral phases under different seawater chemistries, often in the context of deep-sea sediments. I realised that this was an area ripe for some further work, and obtained an Australian Research Council Discovery grant to work on situ shallow carbonate sediment dissolution on coral reefs. Tyler Cyronak, one of my co-authors on the Science paper, moved from the US to Australia to do his PhD with me as part of this project. The dissolution measurements were made by placing benthic chambers underwater on coral reef sands. We showed that extrapolating the dissolution kinetics of CaCO3 phases from laboratory experiments to the in-situ dissolution of shallow coral reef CaCO3 sediments is complicated because light reaches the sediment surface, and the associated diel cycle of productivity and respiration is an important control on whether sediments are net calcifying/precipitating or net dissolving. We also demonstrated that pore water advection is an important control on the dissolution of permeable CaCO3 sediments as it transports O2 into the sediment matrix, stimulating aerobic respiration (Cyronak et al., 2013a). 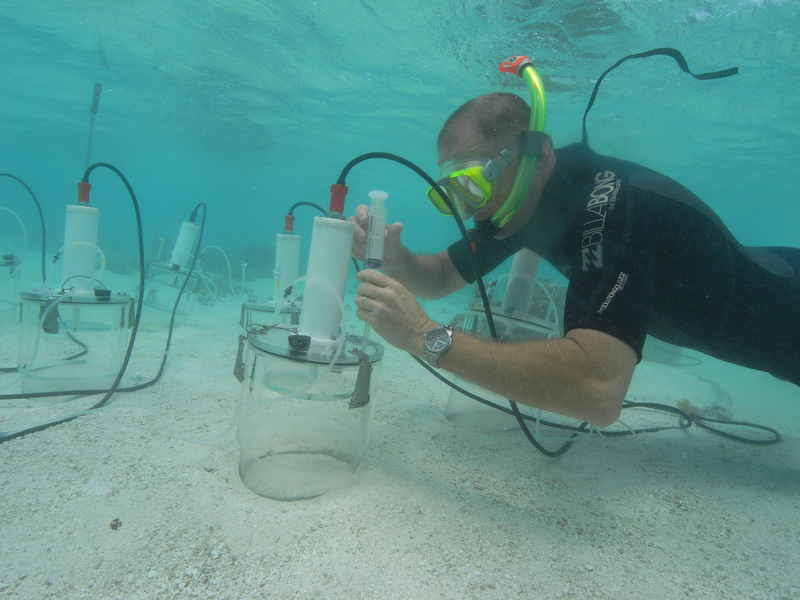 Brad sampling benthic chamber on Heron Island (Credit: Steve Dalton). I presented this work at the International Coral Reef Conference (ICRS) in Cairns in 2012 where I meet Andreas Anderson, another co-author on the Science paper. He had done some previous carbonate sediment dissolution work and was keen to collaborate. In the year following ICRS, Tyler and I made the first in situ measurements of carbonate sediment dissolution under future ocean acidification scenarios, by acidifying the benthic chambers to represent future ocean chemistry at Heron Island, Australia (Cyronak et al., 2013b). I also visited Andreas at Scripps Institution of Oceanography in October 2013 while on sabbatical. We discussed that although carbonate sediment dissolution is clearly critical to the future survival of coral reefs, there is generally much less interest in dissolution than calcification and decided that this was a topic ripe for a review, which we published in Nature Climate Change in 2014 (Eyre et al., 2014). Tyler and I also replicated our Heron Island experiments with acidified chambers in Hawaii while I was on sabbatical where I visited Eric De Carlo and his PhD student Patrick Drupp at the University of Hawaii, co-authors on the Science paper. The sands in Hawaii showed the same response to lower pH as the sands in Australia. This was surprising as we expected the different sands to behave differently. Now we wanted to know if this response was global. I used this preliminary data to obtain further Australian Research Council Discovery funding, with Andreas as a collaborator, to do these measurements at more reefs around the globe. Just after I obtained the funding I got an email from Julian Sachs at the University of Washington (another co-author on the Science paper. ), who did his sabbatical with me at Southern Cross University in 2012, saying he had some funding to work at Tetiaroa, French Polynesia and if I would like to come and do some sediment dissolution work. This was a perfect opportunity to add another coral reef system, and Tyler, now a post-doc at Scripps, and I travelled to Tetiaroa in 2015 to do the measurements. 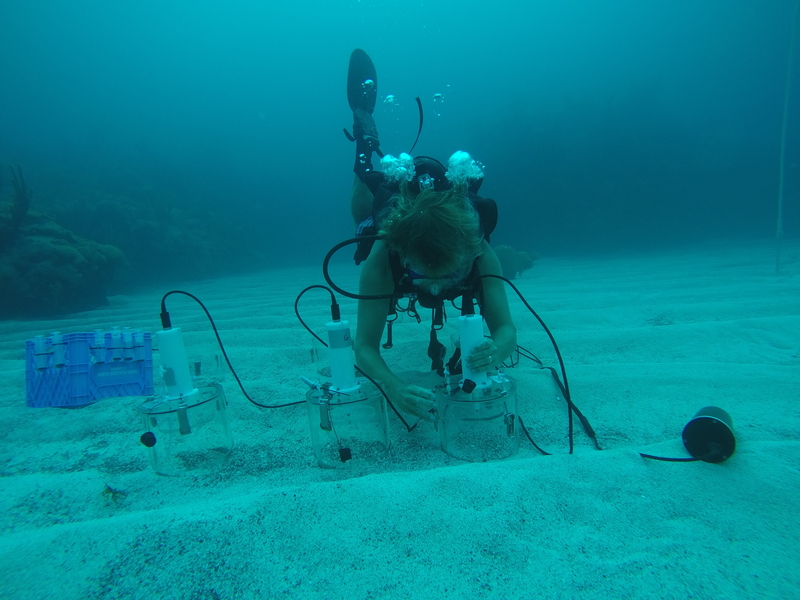 In the same year we also travelled to Bermuda where Andreas was also working, to do some more carbonate sand dissolution measurements. 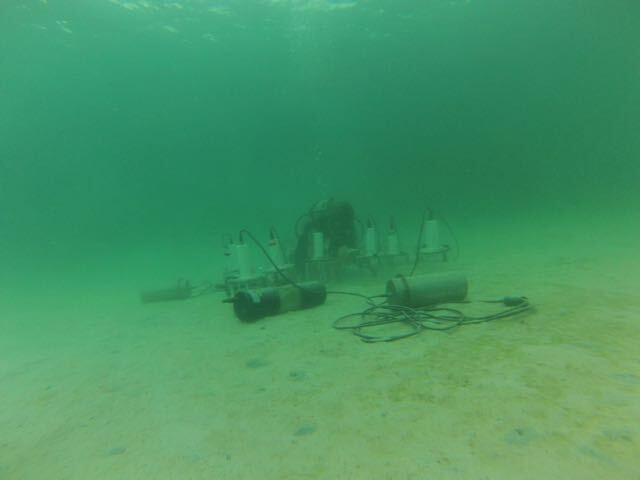 Tyler sampling benthic chambers in Bermuda (Credit: Andreas Anderson). These measurements at 4 coral reefs in 2 ocean basins showed that the rate at which the sands dissolve was strongly related to the carbonate chemistry (acidity) of the overlying seawater and was ten times more sensitive to ocean acidification than the rate at which corals grow. In other words, ocean acidification will impact the dissolution of coral reef sands more than the growth of corals. This probably reflects the corals ability to modify their environment and partially adapt to ocean acidification whereas the dissolution of sands is a geochemical process that cannot adapt. Sands at all four reefs showed the same response to future ocean acidification, but the impact of ocean acidification on each reef is different due to different starting conditions. Carbonate sands in Hawaii are already net dissolving due to ocean acidification because this coral reef site is already disturbed due to large inputs of nutrients and organic matter from the land (you can see in the photos the high turbidity in the water column and more organically enriched sands compared to Bermuda and Heron Island). In contrast, carbonate sands in Tetiaroa are not dissolving under current ocean acidification because this site is near pristine. Modelling of 22 coral reefs shows that the transition to net sand dissolution will vary for each reef, but by the end of the century all but two reefs across the three ocean basins would on average experience sand dissolution. Tyler sampling benthic chambers in Hawaii (Credit: Bradley Eyre). 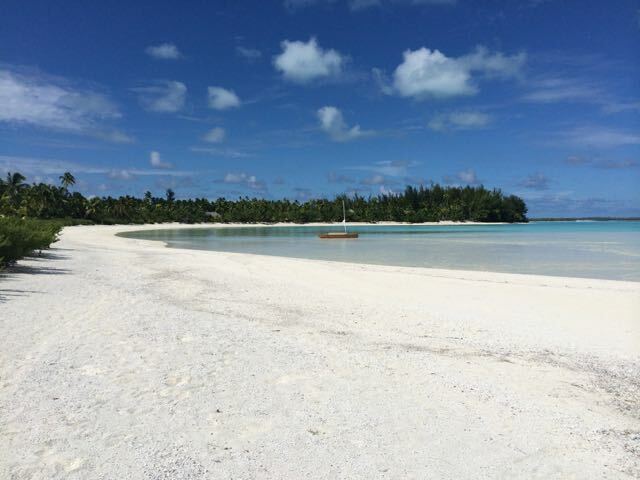 A transition to net sand dissolution will result in loss of material for building shallow reef habitats such as reef flats and lagoons and associated coral cays (see Tetiaroa photo). However, it is unknown if the whole reef will erode once the sediments become net dissolving, as the corals will still grow and create reef framework. It is also unknown if reefs will experience catastrophic destruction once they become net eroding. It is vital that we put pressure on governments globally to act in concert to lower CO2 emissions, as this is the only way we can stop the oceans acidifying and dissolving our reefs. It may be possible to reduce the impact of ocean acidification on the dissolution of reef sands at already disturbed reefs by managing the input of organic matter at local and regional scales. This may provide some hope for some already disturbed reefs, but much more research on this topic is required. Cyronak, T., Santos, I. R, McMahon, A. and Eyre, B.D. 2013a. Carbon cycling hysteresis in permeable carbonate sands over a diel cycle. Limnology and Oceanography 58, 131-143. Cyronak, T., A. Santos, I. R. and Eyre, B. D. 2013b. Permeable coral reef sediment dissolution driven by elevated pCO2 and porewater advection. Geophysical Research Letters 40, 4876-4881. Eyre, B. D., Glud, R. N. and Pattern, N. 2008. Mass coral spawning: A natural large-scale nutrient addition experiment. Limnology and Oceanography 53, 997-1013. Eyre, B. D., Santos, I. R., and Maher, D. T. 2013. Seasonal, daily and diel N2 effluxes in permeable carbonate sediments. Biogeosciences 10, 1-16. Eyre, B. D., Andersson, A. J. and Cyronak, T. 2014. Benthic coral reef calcium carbonate dissolution in an acidifying ocean. Nature Climate Change 4, 969-976. Carbonate sands at Tetiaroa (Credit: Bradley Eyre). I am a biogeochemist with diverse research interests, but mostly focused on the flow of carbon and nitrogen through coastal ecosystems. I work on the Global Change issues of nutrient over-enrichment (Eutrophication), climate change, ocean acidification, greenhouse gases and hypoxia. I work in estuaries, rivers and catchments, near-shore coastal areas, mangroves, seagrasses and coral reefs. I use a variety of research approaches in my work, on scales from a few meters to global estimates, including in-situ process measurements, natural abundance, tracer and compound specific stable isotopes measurements, automated instrumentation, experimental manipulations, ecosystem comparisons, ecosystem stimulation modeling and material mass-balances. Much of my work has been in (sub) tropical coastal systems, but I have also worked in warm and cold temperate and arctic systems. 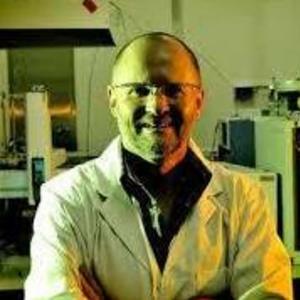 My publications include topics such as whole ecosystem carbon, nitrogen and phosphorus budgets, net ecosystem metabolism estimates, benthic and pelagic production and respiration, dissolved organic carbon fluxes, carbon stable isotopes (fluxes and assimilation), carbon burial and air-sea CO2, CH4 and N2O (GHG) flux estimates, benthic denitrification, benthic habitats and seascapes, historical and ecosystem comparisons, ocean acidification, hypoxia, eutrophication, submarine groundwater discharge, permeable sands, carbonate sand dissolution and coral reef biogeochemistry.